Zumba Dubai, Dubai Zumba, Fitness Dubai, Dubai Fitness, Kung-fu Dubai, Dubai Kung-fu, Dubai Taekwondo, Taekwondo Dubai, Health Dubai, Dubai Health, Weight loose Dubai, Ballet Dubai, Renshi Renjith, Renjith Karate, Sensei Renjith, Yoga Renjith, Karate Renjith, Renshis Fitness, Dubai Health Club, Abudhabi, UAE. The ZUMBA program is a Latin - inspired, dance - fitness class that incorporates Latin and international music and dance movements, creating a dynamic, exciting, exhilarating, and effective fitness system.A ZUMB combines fast and slow rhythms that tone and sculpt the body using an aerobic /fitness approach to achieve a unique blended balance of cardio and muscle-toning benefits. The ZUMBA program integrates some of the basic principles of aerobic,interval and resistance training to maximise caloric output, cardiovascular benefits and total body toning. The cardio-bases dance movements are easy-to-follow steps that include body sculpting, which targets areas such as gluteus, legs, arms, core, abdominals and the most important muscle in the body-the heart. The primary elements that make it so unique and successful are : Its exercise in disguise, its different, easy and effective and so enjoyable that people can't help but want to do it again and again. The ZUMBA fitness is, indeed for the mind, body and soul. The ZUMBA program is a cardio-based workout with components of resistance/sculpting training to tone the entire body and achieve any desired fitness goals. It is a great dynamic core work out with high caloric expenditure which aids the weight loss and nurture a high level of 'feeling good' positive self image. Enjoy the world's latest fitness craze with our best of the town! The King of the martial arts. Learn this ancient Chinese martial art and learn the secrets of animal movements. We teaches monkey, snake, tiger, eagle, leopard, dragon and the very famous drunken with the oriental weapons. From the home of Kung Fu - Shaolin Temple. Chinese Kung Fu International level coaching degree. Chinese Kung Fu International 6th Dan Black Belt. Shaolin Kung Fu 6th Dan Black Belt. The genesis of Chinese martial arts (Kung Fu) has been attributed to the need for self-defense, hunting techniques and military training in ancient China. 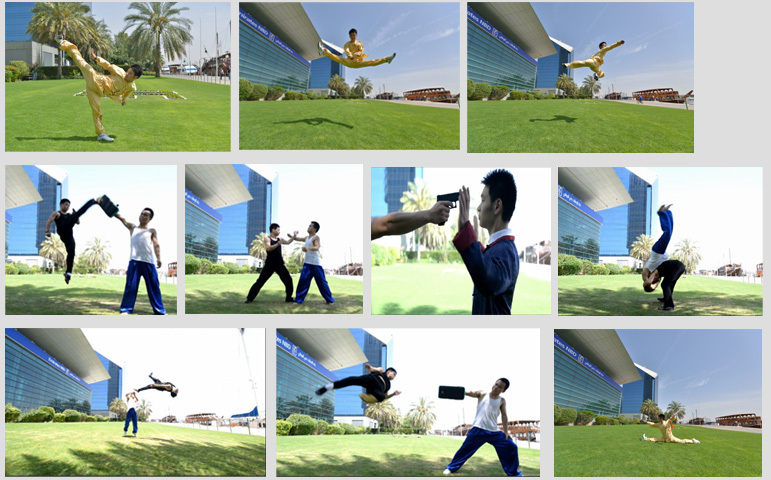 Hand-to-hand combat and weapons practice were important in training ancient Chinese soldiers. From 5+ years old, No need experience, No restrictions ofgender. The tailor made fitness program to focus on the health of the dedicated housewives, which help to keep them sound. This weight reduction fitness program that is the combination of many different fitness workout techniques includes the aerobics, martial arts, yoga, and some cardio-vascular exercises. The much studied combination of exercises and techniques along with alternating between them makes the session very interesting and helps in introducing all the different types of fitness programs to the participants. If your children are interested in taking dance lessons, you may consider enrolling them in a course in classical ballet. Ballet is a form of dance that relies heavily on physical strength and agility, strong concentration skills, an understanding of music and rhythm and a love of movement. Instruction in ballet can provide numerous benefits for children of all ages, regardless of their skill level. Like any dance form, ballet is physically intensive. Ballet requires the use of muscles in the arms, legs and torso, and the various movements are designed to increase physical strength, flexibility and range of motion. Ballet involves a number of exercises that are designed to increase heart rate, which can improve endurance, stamina and overall cardiovascular health. In addition to its physical benefits, ballet can also help to improve children's mental and emotional health. According to the Child Development Institute, training in classical ballet helps to instill a sense of pride and accomplishment which can help to improve self-esteem. As children begin to improve, they may gain a new sense of self-confidence which can be helpful in other areas of their lives. According to the Centre de Danse, classical ballet training can also help children to develop grace, poise and self-assurance at an early age. Ballet is by nature a social activity and it can help young children to develop their social skills. Ballet can also help children to forge new friendships, overcome shyness or awkwardness in social situations and reduce the fears associated with performing in front of an audience. According to the Miami Royal Ballet, instruction in classical ballet provides students with an all-around education in art, music and performance.